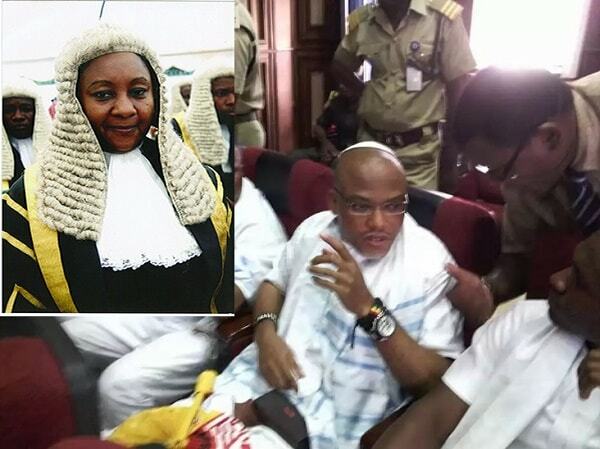 The stringent barbaric bail conditions granted to Mazi Nnamdi Kanu by justice Binta Nyako is another prove that she is unqualified and completely ignorant of her profession. Looking at the body language of the judge and her rulings on April 25, 2017, every reasonable human being will understand how poorly educated, unqualified and how ignorant she is in the field of civil liberty/justice. It has become crystal clear to many that Mrs. Binta Nyako has become a willing tool in the hand of her kinsmen- the northern Nigeria cabals and Muhammadu Buhari to perpetrate their evil machinations and plots against Nnamdi Kanu and Biafrans in general. Justice Binta Nyako's rulings on Nnamdi Kanu's trial have made a serious mockery of the already dying Nigeria Judicial system. It has exposed the corruption that has been ridiculed the judicial system. It is a thing of shame that the same judicial system which had earlier in December 2015 granted an unconditional bail release to citizen Nnamdi Kanu through Justice Adeniyi Ademola which actually was not obeyed by the Nigeria government, have now deviated from its original ruling, to grant a stringent, barbaric and conditional bail to Nnamdi Kanu, after nearly two years of incarceration. It is quite unbecoming and extremely disappointing that a country which boasts to be a democratic entity can go to any length to subvert Justice. One will not be mistaken to say that the judicial system in Nigeria is no longer the hope of a common man, rather, a willing tool of a wicked and tyrannical government. It is even more shameful and annoying that those accused as terrorist will be allowed to walk freely on the street, whereas, Nnamdi Kanu, whose only crime is exercising the right of self-determination for his people, will be subjected to indescribable inhuman treatment such as evil stringent conditions attached to his bail. Judging from the above, one would ask whether Nigeria is now practicing both DEMOCRACY and DICTATORSHIP at the same time, just like it has always practiced both "Civil law and Sharia law in the same country. The truth of the matter is that, Nigeria has always been a lawless nation right from time, but the lawless nature, the brutality, the abortion of justice under this present regime led by Muhammadu Buhari is worse than it has ever been in the past. Nevertheless, Family Writers Press has warned Justice Binta Nyako to without further delay reverse the ill-feted, barbaric and constitutional bail meted on Mazi Nnamdi Kanu and uphold the previous unconditional release pronounced by Justice Adeniyi Ademola on December 17, 2015, in order to avoid unnecessary political crisis that may likly follow as a result of the tension the ruling has caused in the political atmosphere.